The Australian Government is working with industry to boost national productivity and competitiveness. At the heart of the Government’s Competitiveness Agenda is the need to invigorate Australian businesses. Strong businesses create jobs. But to be strong, Australian businesses must have access to the skilled workforce they need to turn good ideas into great commercial outcomes. To do this, the VET system must be more responsive to the needs of industry. The Prime Minister, the Hon Tony Abbott MP, and the Minister for Industry, the Hon Ian Macfarlane MP, have recently made some significant announcements about the future of the VET sector. At the Velg National VET Conference in Brisbane on 11 September 2014, Minister Macfarlane outlined the action he is taking to put industry and employers in the driver’s seat of the VET sector and to refocus the training system on delivering outcomes. The “skills and training sector is firmly in the national spotlight this week as the Government is announcing the most significant reforms to the vocational education and training sector in several decades” said Minister Macfarlane. For further updates on the VET Reform Taskforce, please visit the Taskforce's website. Recently the Prime Minister, the Hon Tony Abbott MP, visited India to strengthen ties in several areas supporting mutual efforts towards greater economic and social progress, including in technical vocational education and training (TVET). He reiterated Australia’s commitment to supporting India’s skills agenda – including the plan to up-skill 500 million people by 2022 – and policy reforms. The valued India-Australia bilateral skills relationship provides opportunities for the Australian TVET sector to share its knowledge on quality training and expertise on developing an industry led TVET system. In the presence of the Prime Minister and his Indian counterpart, the Hon Narendra Modi, on 5 September 2014, a Memorandum of Understanding between the Australian Government’s Department of Industry and the Indian National Skill Development Corporation (NSDC) was signed. The MoU formalises the already strong bilateral relationship between the Department and the NSDC, and is designed to facilitate further engagement on TVET. It encompasses collaboration on occupational standards in priority industry sectors between the two countries, with a view to strengthening engagement between industry organisations and government to promote greater skills mobility within the region. It will also inform the development of skills systems in both countries. Collaboration work on occupational standards between Australia’s Industry Skills Councils and India’s Sector Skill Councils was also given a boost during the Prime Minister’s visit. At a reception with Mr Abbott, two Memoranda of Understanding in the area of telecommunications were signed. This builds upon collaboration work between other ISCs and SSCs in the areas of automotive, healthcare and IT for which Memoranda of Understanding were signed during an Indian skills delegation visit to Australia earlier this year. 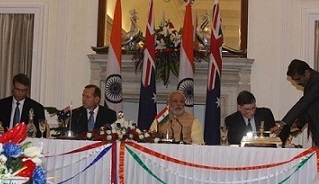 Image (L - R): Australian High Commissioner to India, Patrick Suckling (who signed the MoU on behalf of the Department), Australian Prime Minister Tony Abbott, Indian Prime Minister Narendra Modi and Dilip Chenoy, Managing Director and Chief Executive Officer of NSDC, signing the Memorandum of Understanding on Cooperation in Technical Vocational Education and Training between the Department and NSDC. India Skills Mission 2014 – save the date! On the back of the Prime Minister’s visit to India to strengthen ties in vocational education and training (VET) between the two countries, is an exciting opportunity for training providers and industry stakeholders to participate in the 2014 India Skills Mission. It is envisaged that the Hon Ian Macfarlane MP, Minister for Industry, will lead the delegation to the vibrant, bustling and most populated city in India – Mumbai. the third India Australia Skills Conference, Skills for Better Business, on Tuesday 11 November. These two events provide the unique opportunity of bringing together Australian and Indian industry representatives to explore collaboration and partnership prospects that focus on skills development. With Australia to be a focus country for the CII Global Skills Summit, interest generated in the Australian VET system and the services we can export will be high – come along and capitalise on this! Further information will be made available in the coming days about a dedicated website and registration to attend the Australia India Skills Conference will open shortly. To receive email notification when the website is launched, please email Fiona Martin at the Department of Industry. Are you ready for the USI? The new national Unique Student Identifier (USI) initiative is about to expand our understanding of Australia’s VET sector. From early 2015 almost three million Australians who have enrolled in vocational training will receive a USI. Implemented and managed by the Australian Government’s Department of Industry, the USI is major step forward in helping Australian students by providing online access to a record of their training achievements that will help them get a job or promotion, as well as get credit toward further study. Online access to consolidated records of their training will be extremely useful to students undertaking training a number of times over their life, especially if they train with different providers and in different states and territories. The USI will help them to assemble evidence of their training for job applications and further training. It will also assist training organisations working with clients to complete credit transfers, establishing completion of prerequisites and some forms of recognition of prior learning. The USI provides benefits for administration of the national training system as well as benefits for students and training organisations. With the USI, many more sources of data (although depersonalised) can be linked and analysed to examine trends in program expenditures and effectiveness. The Department’s Jason Coutts is the Acting Registrar and he is pleased to be taking on this critical function under the USI legislation. Jason and his team are working to establish the Office of the USI Registrar, which will provide operational support to the USI Registrar going forward. You can learn more about this exciting initiative by visiting the USI website or by emailing the USI Taskforce. The 2014 WorldSkills Australia National Competition results are in after a massive competition in Perth from 18 to 20 September. The nation’s largest and most prestigious skill and trade showcase was held at the Perth Convention and Exhibition Centre over more than 17 000 square metres of competition and exhibition space. The three day event showcased the skills of almost 500 of Australia’s best trainees, apprentices and students in more than 50 skills and trade areas. The Hunter region won the Evatt Shield for best performed region while New South Wales was the most successful state. Australian Apprenticeships Ambassador and 2012 gold medallist Stephen Beelitz shared his experience as a judge in a blog post. For the full list of medal winners and for more information about the event, please visit WorldSkills Australia’s National Competition website. 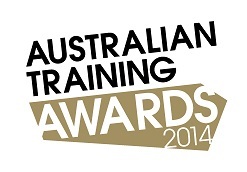 2014 Australian Training Awards – finalists so far! On 21 November this year, the vocational education and training (VET) sector will come together to celebrate and recognise individuals, businesses and registered training organisations for their outstanding contribution to skilling Australia at the 20th annual Australian Training Awards in Adelaide. The majority of the awards are the culmination of the state and territory awards with winners from each state and territory eligible to compete at the national level in aligned categories. There are also seven award categories available by entering directly to the Australian Training Awards. Finalists in 11 of the 18 categories have now been announced, with the remainder to be announced in mid-October. The Lifetime Achievement Award recipient will be announced at the Australian Training Awards presentation dinner event in Adelaide on 21 November. For more information about the Australian Training Awards, visit the website, phone 13 28 46 or email the Australian Training Awards team. Follow the Australian Training Awards on Twitter @AusTrainAwards. Competency-based wage progression is becoming widespread for apprentices as more industrial awards are changed to provide for it. It now applies to many apprentices working in metal trades, building trades and printing trades among others. The Australian Industry Group, in partnership with selected RTOs from across Australia, has been working on processes for ensuring competency based wage progression meets the needs of all partners to an apprenticeship – employers, RTOs and the apprentices themselves. Called Engineering Excellence, and funded by the Department of Industry under the Accelerated Australian Apprenticeships programme, the Ai Group project has focused specifically on the metal trades, but the processes that have been developed have broader application. Early next year the Engineering Excellence partners will be offering information sessions for RTOs, GTOs and other stakeholders to share the findings from the project and showcase some of the tools that have been developed. If you wish to register your interest in attending a session or would like to discuss competency based wage progression further, please email the project manager, Peter Canavan. Australian Apprenticeships Ambassador and 21-year-old boilermaker Mitch Hansen has described how he is building a house out of shipping containers in the Northern Territory. Remarkably, Mitch works on the project on his days off from his full-time role with BHP Billiton – Gemco, with the help of his father and grandfather. To read about this unique family construction project, read Mitch’s Australian Apprenticeships Ambassador column. Sarah Jayne Flatters (pictured, left) is a 25-year-old electrician from Perth who, upon completing her Australian Apprenticeship, started TradeUP Australia. 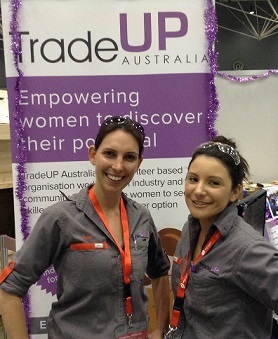 TradeUP Australia is a volunteer-based non-profit organisation that aims to encourage more women to see skilled trades as a viable career option. Sarah Jayne has penned a blog post about the first year of TradeUP Australia with highlights including linking up with fellow Australian Apprenticeships Ambassador Emma Stevenson (pictured, right) and attracting more than 200 people to workshops. 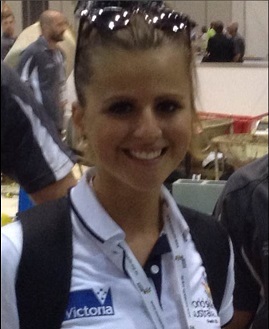 Sarah Jayne’s Australian Apprenticeships Ambassador column is now available online. The Australian Apprenticeships and Traineeships Information Service has produced a series of videos where apprentices and trainees respond briefly to set questions about their job and job hunting experiences. The Australian Apprenticeships – My Gain videos are aimed at young people contemplating career pathways and where to look for job opportunities. Videos are recorded in partnership with organisations involved in making apprenticeships and traineeships work. A great example is Josh who is completing an apprenticeship as a fitter and turner with his training conducted at Chisholm Institute in Melbourne. Meanwhile, in Western Australia, CCI Apprenticeships Solutions helps Charlotte and her employer through a veterinary nursing traineeship. More apprenticeships and traineeships resources are available through the Australian Apprenticeships Pathways website. Practice aptitude quizzes, produced by the Australian Apprenticeships and Traineeships Information Service, are a popular resource for use with students and jobseekers. The quizzes provide a general illustration of the literacy, comprehension and maths standards required when undertaking entry level training in around 30 industries. A short survey is now open seeking feedback on the resource. Responses will help evaluate the quizzes and direct their future development. Each year, AgriFood Skills Australia develops its environmental scan – the ‘early warning system’ for Australia’s vocational education and training system and governments on industry’s skill and workforce development needs. Based on real-time views and evidence from across the country, it sets out the factors impacting on the shape and capability of the agrifood workforce, and how well the VET system, its products and services are responding – and importantly, what needs to happen. The single most important factor in determining the agrifood industry’s future will be its education and skills base and how well we use new knowledge and innovation to build a highly productive, dynamic and adaptive workforce. Many see the next few years as transformative. Grass roots insights and immediacy of industry intelligence are what sets the environmental scan apart from other reports in the VET system. For this reason, the scan is not about recycling already published statistics or economic analyses found elsewhere, which by their very nature are historical. Rather, it’s about your views and conversations with industry, those doing the jobs, employing the workforce and providing support services to industry – all of whom experience firsthand the issues needing to be written about and to which the VET system needs to respond. For more information, to register to participate in the consultations in your home state or to otherwise provide AgriFood Skills Australia with your views, please visit AgriFood's website. A review is currently underway of the arboriculture qualifications framework and associated units of competency within the Agriculture, Horticulture and Conservation and Land Management training package. The review has been initiated as a response to a number of submissions to the AgriFood Continuous Improvement Register and subsequent discussions with industry which indicate that the current qualifications framework does not accurately reflect job roles currently performed in the arboriculture industry. The review is being conducted in three phases. Phase one was completed in December 2013 with the endorsement and publication of an updated Certificate II in Arboriculture. The qualification was amended to move climbing units from the core to the elective bank in order to provide an outcome for ground-based workers. Additionally, two imported units in the core of the qualification were superseded and needed to be replaced. Phase two is currently underway. This involves review and development of training package components for entry level and trade level jobs. Job role statements for entry level job roles have undergone broad industry consultation and validation, following which a set of draft components including a further updated Certificate II in Arboriculture will be released for broad consultation. The job role statement covering trade level jobs will be released for broad consultation shortly, prior to the development of a revised Certificate III in Arboriculture. Phase three of the project, to review job roles for supervisory and higher level strategic workers and review and develop related components, will commence once job role statements for lower level jobs are complete. Further information is available from AgriFood’s website. If you would like to receive consultation materials, please email AgriFood. You can also join AgriFood's online community and sign up to receive AHC training package alerts when new materials are released. A review of the retail baking qualifications framework and associated units of competency within the Food Processing training package is currently underway. The review has been initiated as a response to a number of submissions to the AgriFood Continuous Improvement Register from industry associations and enterprises indicating that the current qualifications framework does not accurately reflect current retail baking jobs. Following initial desktop research and targeted industry consultation, a set of job role statements has been developed describing jobs in the retail baking sector and associated skills and knowledge. These job role statements have undergone broad industry consultation and following review, will be released for validation. Once validated, the job role statements will inform required development work to ensure retail baking qualifications meet industry’s needs. More information is available on AgriFood’s website. If you would like to receive notification when consultation materials are released in future, please email AgriFood. You can also join AgriFood's online community and sign up to receive FDF training package alerts when new materials are released. The job roles statements developed through these projects will be used to inform qualification design during transition to the National Skills Standards Council Standards for Training Packages. If you would like to be involved in consultation on job roles in the identified sectors, please email AgriFood. Don’t forget to note which project or projects you would like to be involved in! You can also join AgriFood's online community and sign up to receive training package alerts when new materials are released. AgriFood was very excited to receive the Industry Collaboration Award for The Eyre Peninsula AgriFood National Regional Initiative at September’s South Australian Training Awards. The Initiative has engaged over 500 people in the Eyre region to date and lists the Tuna to Grain Cross-Industry Skilling Project, Employer of Choice, Be the Best Boss and Be Drought Prepared workshops as four of the 20 successful projects run under the Initiative in the Eyre region. More information is available on AgriFood's website. The following is a summary update on the current CPSISC training package re-design projects. New qualification and units are in final stages in preparation for endorsement. For further information, please visit the Drafting project web page. The Project Reference Group (PRG) met on 28 May 2014 and approved the Project Plan. The project’s development strategy is now available. For further information and to download the development strategy, please visit the Cleaning project web page. First draft units, qualifications and skills sets have undergone stakeholder consultation and feedback. For further information, please visit the Pest Management project web page. The Project Reference Group held its first meeting on 8 September 2014 and approved the Project Plan. For further information and to download a copy of the Project Plan, please visit the SSIS qualification redesign project web page. Final draft qualifications and units of competency now being prepared in preparation for final endorsement. For further information, please visit the Building Surveying project web page. Qualification and units are in their final stages in preparation for endorsement. For further information, please visit the Fire Systems Design Management project web page. First draft units and qualifications are now under development and the development strategy is now available. For further information and to download the development strategy, please visit the Signage project web page. First draft units and qualifications are under development. The development strategy is now available. For further information and to download the development strategy, please visit the Shopfitting project web page. This project is currently in the initial research and consultation stage and a development strategy is being developed. For further information, please visit the Carpentry project web page. Re-design of the Property Development, Sales and Management qualifications. IBSA is pleased to announce the release of new SCORM-compliant e-learning resources for a range of BSB07 Business Services and TAE10 Training and Education units. Providers can integrate IBSA’s e-learning resources into their existing Learning Management System, or implement IBSA’s very own Learning Management System. Coordinate and facilitate distance-based learning (TAEDEL403A). RTO guides and facilitator resources for each unit. To support your business, flexible terms are available with monthly and quarterly payment options. If you wish to purchase e-learning resources, please email IBSA or call 03 9815 7000 to speak to an Account Manager. IBSA is pleased to announce the release of updated learning and assessment materials for BSBSUS501A Develop workplace policy and procedures for sustainability; including a student workbook (spiral-bound or hole-punched) and a facilitator and assessor guide (on CD). The third edition of this resource incorporates substantial changes to Assessment Task 1 and minor changes to Assessment Tasks 2 and 3, as well as updated student workbook and facilitator guide content. You can purchase the third edition of BSBSUS501B products or view samples on IBSA's website. If you wish to purchase in bulk, please email IBSA or call 03 9815 7000 to speak to an Account Manager. IBSA has over 200 entertaining and interactive e-learning modules, workbooks, and Facilitator and Assessor Resources to support the BSB07 Business Services and TAE10 Training and Education Training Packages. For a full list of available units, visit the IBSA online store or the IBSA product catalogue. The WorldSkills Australia National Competition was held in Perth in September. The competition allowed many Australians to demonstrate their skills and trade. However, competitions such as these are not possible without the judges and team leaders. This month, we feature three people whose contribution to the running of the national competition assisted in making it such a fantastic success! Mathew Hall returned to the WorldSkills Australia National Competition as a judge in 2014. Mathew won a silver medal at the 2010 competition and was part of the bronze-medal winning Australian manufacturing team at the 2011 international competition. The fitter and turner from Stawell, Victoria, won the Victorian Apprentice of the Year title in 2009 and is a former Australian Training Awards’ finalist. Mathew, an Australian Apprenticeships Ambassador, says he is grateful for the skills learned through his Australian Apprenticeship and WorldSkills competitions. “Undertaking an apprenticeship allowed me to work in the town I grew up in,” Mathew said. 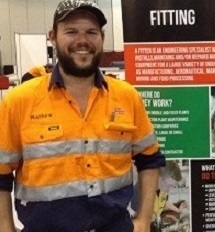 To learn more about Mathew’s success story, visit the Australian Apprenticeships website. Australian Apprenticeships Ambassador Dayne Robinson won a gold medal at the 2012 WorldSkills Australia National Competition and was part of the 2013 Team Australia Skillaroos. In 2014, Dayne was a team leader for the floristry category at the 2014 WorldSkills Australia National Competition. An inherent flair for creativity was the key reason behind Dayne’s decision to undertake an Australian Apprenticeship in floristry. “I am lucky enough to work in a creative and beautiful work setting every day,” Dayne said. To read more about Dayne’s excellence, visit the Australian Apprenticeships website. 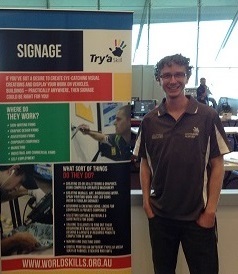 Josh Tunbridge was involved in this year’s WorldSkills Australia National Competition as a judge in the signwriting category. The 29-year-old from Wollongong remains employed with the family business which he plans to own in the future when his father retires. “Not only do I like the fact that my Australian Apprenticeship has given me a career that I love, but the bonuses – like WorldSkills – have been amazing,” Josh said. To learn more about Josh’s success, visit the Australian Apprenticeships website. The Australian Apprenticeships and Traineeships Information Service websites provide practical and easy to use resources and information about Australian Apprenticeships. CPSISC is once again holding a round of free e-learning professional development workshops for its RTOs, to demonstrate the latest products and techniques available within the VET sector. The workshops will provide interactive forums to demonstrate and discuss the latest technologies and best practice being used by RTOs to implement training packages in the construction and property services industries. The Queensland Council for Adult Literacy is hosting the 37th annual conference of the Australian Council for Adult Literacy (ACAL), Literacy: a learning spiral for life, in October 2014. How do literacy and numeracy theories and research outcomes inform our practice? How do national or state policies affect the individual learner? How can we ensure that teachers and trainers have the knowledge and skills to meet individual needs? ACAL is inviting interested parties to participate in the conference by giving a presentation, a workshop or a colloquium, or by joining in the discussion and networking. A pre-conference forum, Frameworks: do they inhibit or enhance the literacy spiral?, will be held on 2 October. The forum will focus on frameworks such as Foundation Skills, the Australian Core Skills Framework, Core Skills for Work, Core Skills for Employment and Training, Skill Sets and the VET Practitioner Capability Framework, what they are, how they fit together, and how they relate to literacy and numeracy programmes and individual learners. Professor Diana Coben PhD, Director of the National Centre of Literacy and Numeracy for Adults at the University of Waikato, New Zealand and Emeritus Professor of Adult Numeracy at King’s College London, UK. Further conference information, keynote speaker profiles and the call for presentations, is on the conference's website. All registered training providers are required to report their 2014 training activity data to the National Centre for Vocational Education Research’s (NCVER) National VET Provider Collection in early 2015. Applying the Australian VET Management Information Statistical Standard (AVETMISS), RTOs must provide the information they have collected during 2014, including new enrolments, re-enrolments and completions. What is AVETMISS reporting? What data do I need to collect? How do I find an AVETMISS compliant software system? How do I know if my data is AVETMISS compliant? When, how and who do I submit my data to? How can I use AVETMISS data to inform my business practices? Places are filling quickly so please register your interest through NCVER’s Portal. 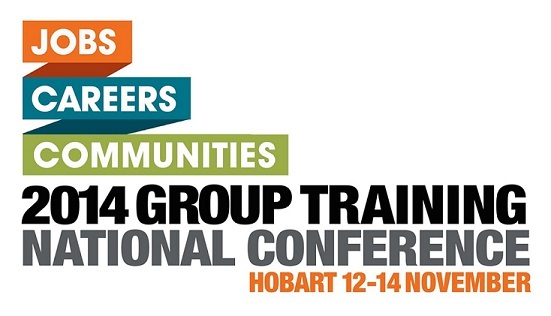 GTA and the Department of Industry sincerely apologise for the oversight in referencing the late Peter Underwood, Tasmania's former Governor, in the earlier promotion of the 2014 Group Training national conference. On behalf of the WELL/Foundation Skills network, IBSA has compiled into a single repository all the free foundation skills resources developed by each of the Industry Skills Councils to support VET practitioners. IBSA hopes you find it useful, and looks forward to receiving feedback. If you would like to provide feedback, supply an article for inclusion in the next edition or join our list of subscribers, please email skillsatwork@industry.gov.au. The next edition will be published in November 2014. Submissions are due by 17 October 2014.